San Antonio, Texas and River Walk are beoming more accessible. and other city programs and services are becoming more accessible than ever before. Until recently, it wasn't possible for people with disabilities to fully experience San Antonio, home to one million people, the ninth largest city in the United States. 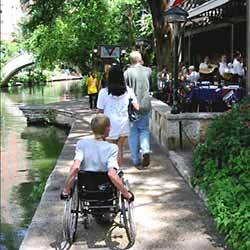 Back in 1993, the Department worked with the city of San Antonio to make the River Walk more accessible and welcoming to people with disabilities, including those who use wheelchairs. 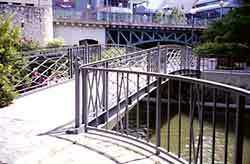 Located 20 feet below street level, the River Walk consists of cobblestone and flagstone paths that run along each side of the spring-fed San Antonio River through the business district. Before the city took on this project, access for people with disabilities was severely limited. With accessible entrances only at each endpoint of the two-and-a-half-mile walkway, someone who could not climb stairs couldn't easily reach the many shops and restaurants along the way. The lack of accessible bridges to cross the river left people with disabilities stranded on one side or the other. Although both the scope and historic significance made the project a challenging one for the city, the city responded and was clearly up to the task. Now, people with disabilities can truly experience all the River Walk has to offer. The days of being stuck on the River Walk until one reached the accessible entrance at each end are long gone  there are now three access ramps descending from street level and four elevator access routes from riverside hotels. Wheelchair users can now cross the river via an accessible bridge. And directional signage now ensures that patrons with disabilities can take full advantage of the accessible routes by pointing them in the right direction. New hotels and businesses have agreed to provide direct access from their businesses to the River Walk. All of which permit thousands of people with disabilities to more fully experience one of San Antonio's major attractions. This pride continues to move the city forward. Following a 1999 compliance review by the Department, the city has committed to making itself even more accessible to residents and visitors with disabilities. For the next 24 months, the city will make significant accessibility modifications to buildings throughout San Antonio, including the city hall and annex, the convention center, several city parks, police headquarters and substations, theaters, a courthouse, and other buildings. Barriers to access, such as inaccessible entrances, toilet rooms, parking, service counters, and wheelchair seating, will be removed. The city has also agreed to install raised letter and Braille signage, as well as signage directing people with disabilities to accessible features, in buildings throughout the City, where needed. The city will also include its TTY telephone numbers on all letters sent to the public from every city office, ensuring that people with communication disabilities can conduct business with the city directly by telephone. 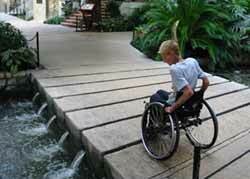 The city of San Antonio has come a long way since it took its initial accessibility steps on the River Walk. Its continuing commitment to bring people with disabilities into the mainstream of the community has been clearly stated. From the River Walk to City Hall, from Monterey Park to the Municipal Courthouse, people with disabilities can be assured that they will be able to fully participate in the San Antonio experience.